Porter Consulting Engineers were pleased to read that the synthetic turfs designed by our Practice at Guildford Grammar School and Warwick Hockey Centre were recently used for international games between Australia’s women’s field hockey team, the Hockeyroos and Spain. The venues hosted 4 of the 5 fixtures during the 3rd week of January, as part of a 5-match Test series ahead of the 2018 Commonwealth Games on the Gold Coast. Guildford Grammar School’s hockey field and Warwick Hockey Centre were scheduled to host two matches each, with the fifth to be played at Perth Hockey Stadium. Australia claimed one win and three draws during the series which was reduced to four Test matches after the first game was cancelled due to heavy rain. The two sides played an unofficial match on 23 January at Guildford Grammar to replace the abandoned game. Our team has extensive experience in recreational and synthetic turf projects having designed the majority of synthetic hockey turfs in WA and we are familiar with the latest products and standards. 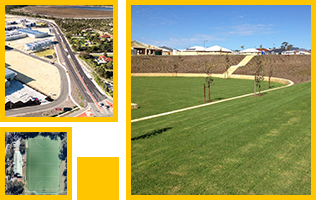 In addition to Guildford and Warwick, we are presently involved with replacement turf projects at HBF Arena Joondalup and Aquinas College, as well as the detailed design of a new synthetic hockey turf at Sutherlands Park in Southern River. Congratulations to Guildford Grammar School and the Whitford Hockey Club on their hosting duties for these international hockey matches which provided a valuable opportunity for fans and local players to view top level hockey in Western Australia.